Nokia launched its first ever powerful Android based Smartphone back in February and now it starts shipping the phone. Nokia 8 Sirocco was unveiled by the company almost a month ago and shipping started from April 30th. So, the phone is yet to reach the hands of the buyers who have preordered the phone. HMD Global finally pushes the premium flagship phone for the fans who were asking for it for a long time now. It seems to have all the latest hardware and software assistance with great camera support. If you are among the people looking to order this high-end smartphone from the company that came back from the dead, then here is our full review of this upcoming device. With Nokia 8 Sirocco, the company has shifted its design taste from a boring rectangle or block type look to something new. Sirocco is much of a smart and premium looking smartphone that is mostly covered with the glass. 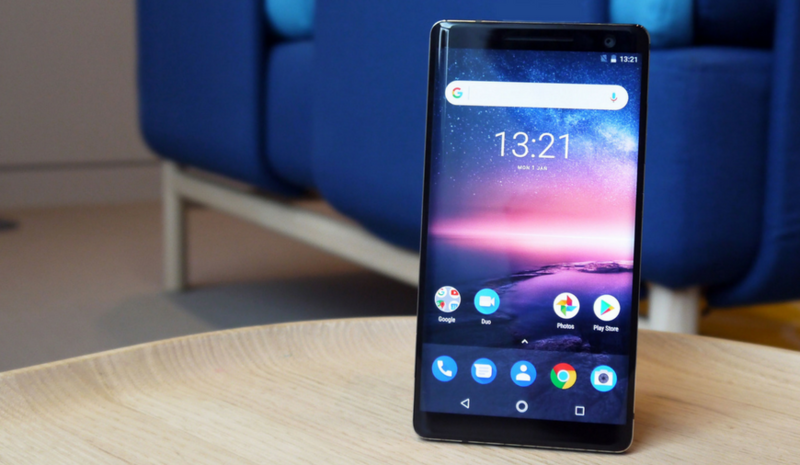 The frame of the Nokia 8 Sirocco is guarded with stainless steel and the maximum part of Nokia 8 Sirocco is composed of Gorilla Glass, which makes it prone to scratches. However, the glass doesn't let any finder print to ruin the look and the glassy shiny look will tempt you to instantly replace your current phone with this masterpiece. The rounded sides with a curved display of the phone make it bit look like Samsung Galaxy 8 and Blackberry priv. This makes Nokia 8 Sirocco to comfortably gets in your palm and it can be used conveniently with a single hand as the display is 5.5 inch only. The only part that I didn't like are the pointed edges that sometimes feels annoying in the hand otherwise the design of Nokia 8 Sirocco have my heart. The smartphone owns a 5.5-inch P-OLED capacitive touchscreen display with bezel-less makes it looks a worthy rival against the available flagship smartphones. Nokia 8 Sirocco comprises an 81 percent body to screen ratio with its 16:9 aspect ratio of the screen that delivers 1440 x 2560 pixels resolution. The Polymer light emitting diode display with QHD support offers a truly impressive experience while interacting with the screen. The display looks far more alive and colors responsive comparing to its predecessor Nokia 8. In addition, the IPS67 dust and water resistance makes the screen tougher to handle the uneasy situations along with the protection of Corning Gorilla Glass 5. Nokia’s latest available flagship smartphone has a very powerful processing unit and able to deliver an impactful performance. The device is equipped with Qualcomm Snapdragon 835 chipset at its heart which is coupled with 6GB RAM and 128GB internal storage. This makes the Nokia Sirocco a device with everything that you need to feed your tech hunger. However, with the new generation chipset being equipped with some of the upcoming flagship phones, Nokia may face criticism over the older chipset. But, for now, Nokia 8 Sirocco has enough power to challenge available rivals in the market. Along with this, the Sirocco comprises a dual 12MP rear camera with the primary lens with f/1.8 and second lens having a f/2.6 aperture. The camera of Nokia 8 Sirocco has been crafted by Zeiss optics, an old friend of Nokia for taking care of the cameras. The dual camera lens is capable of offering dual pixel phase detection autofocus, 2X optical zoom, Zeiss optics supported by a dual LED toned flash. The camera also features the Live Bokeh mode that let you manage the blur effect in the shots. By flipping the phone you will get a 5MP front camera that comes with f/2.0 aperture and 1080p. The Nokia 8 Sirocco you will be getting a 3260 mAh non-removable battery that lasts up to 419 hours on standby with Quick Charging. Nokia has also added the Wireless charging (Qi) support to the new device. There is a fingerprint sensor at the back of the phone located beneath the camera. Nokia 8 Sirocco runs on Android 8.0 right out of the box and the platform is stock Android. Nokia has announced the phone in February 2018 and the shipping has started yesterday in India.Nokia 8 Sirocco costs Rs 49,999 in India right now and still opens for the order only on the Nokia’s own website. Nokia Sirocco 8 hast it all that a smartphone user expects from a new generation device. The powerful processing unit and the delightful camera will never disappoint you and the phone runs very smooth on the stock Android as we found in our review. Nokia also guarantees all the latest updates including the security patches for the OS. However, the only drawback of the phone may its older chipset and a bit higher price. But, with the full high-end specifications and features, Nokia successfully entered into the flagship smartphones competition.